The Professional Regulation Commission (PRC) officially announced on Friday, June 19, 2015 the complete list of passers for June 2015 Architect board exam. 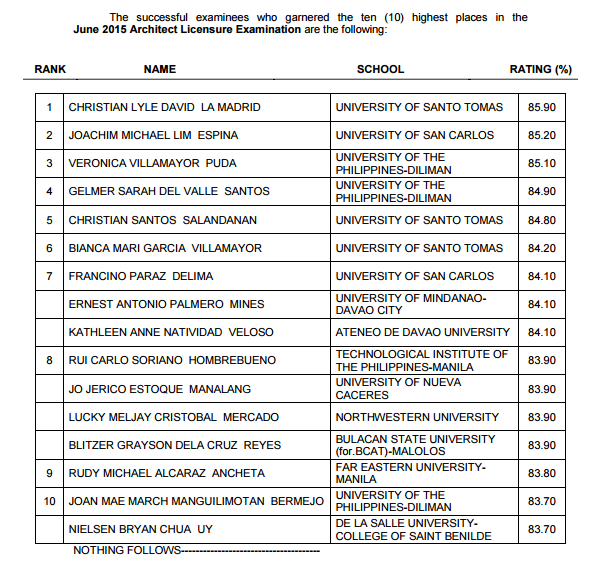 Christian Lyle David La Madrid from University of Santo Tomas (UST) topped the board with 85.90 percent grade. Joachim Michael Lim Espina of University of San Carlos (USC) placed second with 85.20 average grade. University of the Philippines (UP) - Diliman alumna Veronica Villamayor Puda garnered the third highest place.